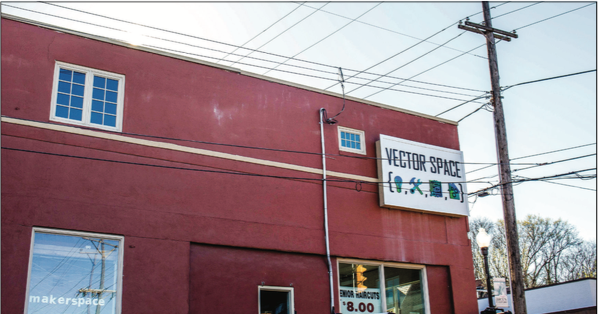 LET’S GET CREATIVE — Vector Space teaches programming, metalworking, 3D printing and more. At first glance, Vector Space is organized chaos. Boards, wires, scraps of leather and equipment sprawl over tables and handmade shelves. Raucous machinery bursts through the atmosphere. But at second glance, Vector Space is genius in the making. A 3D printer being built from dumpster parts sits on one table. The remains of a space balloon that captured pictures from 115,000 feet in the atmosphere hangs from the ceiling. “Making is fun, and really, everyone is a maker,” Executive Director Elise Spontarelli said. Vector Space is a nonprofit organization in downtown Lynchburg devoted to making anything from technology to art by providing access to materials, equipment and instruction in a community-based setting. Elise Spontarelli said she and her husband had heard of makerspaces in other cities. With her background in graphic design and business and her husband Adam Spontarell’s in engineering, they combined their strengths to make their own makerspace. “What we really want to instill in people is just a love of learning and the confidence and feel-good feeling that you get after you actually make something,” Elise Spontarelli said. A Vector Space membership is like a gym membership, Elise Spontarelli said. Members pay a monthly fee of $60, or $40 for students, and in return get discounts on classes and a key to the building for 24-hour access to equipment, most materials, and storage space. Vector Space has roughly 35 members. The nonprofit also holds about five workshops per month, often taught by members. These workshops last 3-5 hours and teach specific skills such as programming, 3D printing, leather bookbinding, screen printing, metalworking and sewing. Upcoming workshops can be found at vector-space.org/workshops. Vector Space has worked with local K-12 grade students — everything from seeing how computers work by taking them apart to building a quadcopter drone from scratch. Most recently they hosted their Maker Faire at Randolph College that drew 1,000 people and 25 booths from local makers. Thomas Key and Cody Williams, two mechanical and material science seniors at the University of Virginia, come every day to their unofficially-claimed spot at Vector Space: two computers side-by-side on a table. They stay in Lynchburg for their internships, but frequent Vector Space to work on their senior capstone project, a generator built from 3D printed parts to be used in third-world countries. “Surprisingly, from all the research we’ve found, a lot of people in third-world countries have cellphones,” Key said. But to charge these cellphones, they have to go to central generators in towns, Williams said. The personal generators would help alleviate that problem. The two said if the project takes off, they will consider selling it in the U.S. for outdoor or camping purposes. Elise Spontarelli said Vector Space could be valuable for college students working on projects. Not only could they get access to equipment and materials, but they could also work alongside other engineers and professionals in a variety of fields. Kurt Feigel, the creator of the dumpster-part 3D printer, said he did not find out until his third year in college that he was good at math. If he had known, he probably would have majored in engineering, he said. But today his engineering mind finds an outlet at Vector Space, where he comes as a hobbyist at least once a week. “I think it’s the best-kept secret in town,” Feigel said.